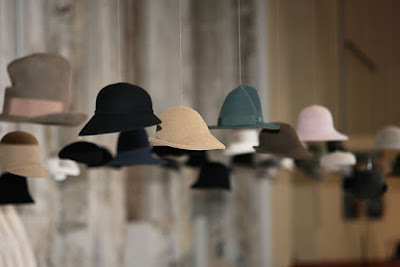 Another hat display idea, this one from Kris Van Assche at last year's Pitti Uomo fair. My apartment is too small to make this work, but I like the look of hats floating above the ancient Medici stables. But how would you attatch the hats to the strings? it's so convenient too. all you have to do is duck under each hat to try it on. was this really in a medici stable? i went on a class excursion to one of the medici castles in firenze, and it as pretty darn amazing. lovely as always ms. adeleine! I love the black one next to the beige one. It's very "prairie meets twenties" Chic. I love this display! Kris not only make great hats but I love his menswear! Beautiful pic and great idea! This would be worth getting a collection of hats for(something I've been resisting). wonderfully creative! i love seeing new ways to display things (since I have a boutique and need fresh ways to show off products).